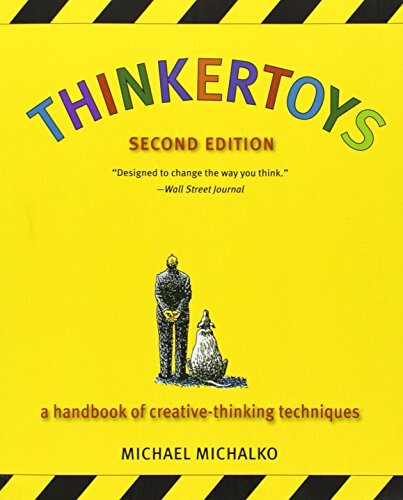 QUICK SUMMARY: Thinkertoys: A Handbook of Creative-Thinking Techniques (2nd Edition) is a book full of ways to come up with ideas, solutions, or even undiscovered problems. The “thinkertoys” themselves are strategies one can use to break down one idea into many ideas, one problem into many solutions, or one hope into many possibilities. 1. If you break down a problem to find a solution for parts of the problem and you’ll find a solution for the problem as a whole. 2. It’s important to look at a situation using an infinite amount of different views to find ways to improve it rather than using the obvious problem-solving techniques. 3. You can never reach “too great” – always strive for more and better. 4. Think futuristically to find undiscovered goals and solutions you didn’t even realize you wanted or could achieve. 5. You can generate any idea at any time, even if you’re starting from scratch. The important thing is to have a problem that needs a solution, or have a goal to begin with. 1. If a process seems broken, unnecessarily complicated, or inefficient, instead of adjusting the entire process, you can look at the individual components to fix part of the problem which could fix the problem as a whole. 2. Think of a possible new solution from scratch rather than dwelling on the obvious solutions you have already found which have not been feasible. 3. A “problem” isn’t always seen as a problem. You can always improve anything and you should never assume that something is as good as it can get. If you act like an idea person, you will become one. Just do a little bit at a time and get started. Sometimes assumptions seem so basic that we never think to challenge them. Nonexperts do not have enough expertise to draw borders. Interested? Buy the book here!